This companion is a rare tier Drust archaeology item. It is created by discovering and "solving" 185 Drust Archaeology Fragments. Players may utilize up to three Etched Drust Bones to aid in the solving of this item. Once completed, an entry on the Restored Revenant can be found in players' archaeology tab: "During times of war, the Zandalari faced off against many powerful foes. Some, even, that they could not break. Their witchdoctors devised these cursed pots and through the use of powerful magic, summoned them at different locations within the enemy's encampment. Shortly after, a fountain of frogs would spring forth, causing a ruckus and confusing the enemy in the process. Little did they know that these frogs carried a plague with them that would quickly devastate their ranks and force them to retreat or surrender." Bites at the enemy, dealing 394 Beast damage. Deals 256 Undead damage and turns the target rabid for 3 rounds. While rabid, the target deals 25% additional damage and receives 50% additional damage. Hurls bones at the enemy, dealing 531 Undead damage. Release a bone chilling howl that frightens the target, increasing the damage they take on the next attack by 100%, lasts 2 rounds. Reanimate, healing for 492 health every round for three |4round:rounds;. Deals 788 Undead damage and stuns the user for 1 round. 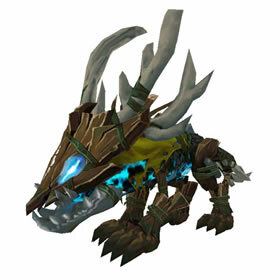 Undead pets return to life immortal for one round when killed, but deal 25% less damage. Its like an Iron Starlette pet but for humanoids. Rabid Bite, Howl, then Ghost strike for massive damage. You can even juke it for an extra turn to trigger defensives. The Drustvar people learned over time that when burying someone or some thing that there are sadly a number of shady people looking to exhume and reanimate whatever they can find.